Primetime King Coco Martin remains to be the top mainstream leading man today. He is so successful in terms of TV series. His current action teleserye FPJ's "Ang Probinsyano" is still the leading primetime TV series today and it's already running on air for more than one year making it as the longest running TV series of 2015 and 2016. Coco is also a blockbuster actor. His two consecutive movies namely "Beauty and the Besty" and "The Super Parental Guardians" were both top grossing box-office films! 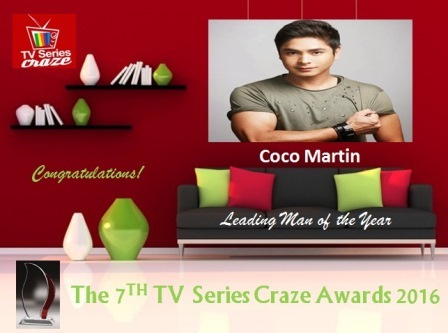 With his various achievements this year, Coco Martin hailed as our Leading Man of the Year here in our very own, The 7TH TV Series Craze Awards 2016. In terms of endorsements and TV commercials, Coco is still the top favorite! He is seen in most of the TV commercials today. A food chain, a cough syrup, a corned beef, a coffee, and a milk brand are some of his TVCs.